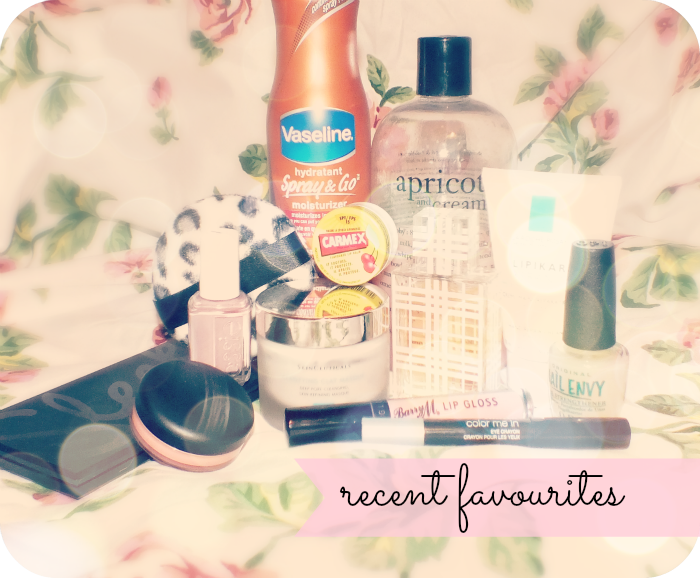 You might have noticed that unlike many bloggers, I don't do monthly favourites. A month just passes by too fast for me, so I opted to forgo the monthly time line, and just post a few favourites when ever the mood hit me. Like now! Okay, so it might have been last week, but I put quite a bit of thought into my selections. I find it's really easy to get carried away, so I've tried to only select my most beloved products of late.Still, this might be a long one... So, go make a tea, grab a cookie and settle in for a little beauty chat. I have a bad habit of picking up perfumes on a whim, and then not using them. Burberry Brit Eau de Toilette was one of those, but I decided I needed something different for spring, so I pulled this out. I don't know why I waited so long to use it, it's such a wonderful scent! If I had read the notes of this scent before purchasing, I'm sure I would have passed it by, so this was a perfect impulse buy, that worked out perfectly for me. I can't really detect the individual notes but it consists of Italian Lime, icy pear, green almond, white peony, sugared almonds, amber, mahogany, vanilla and tonka bean. 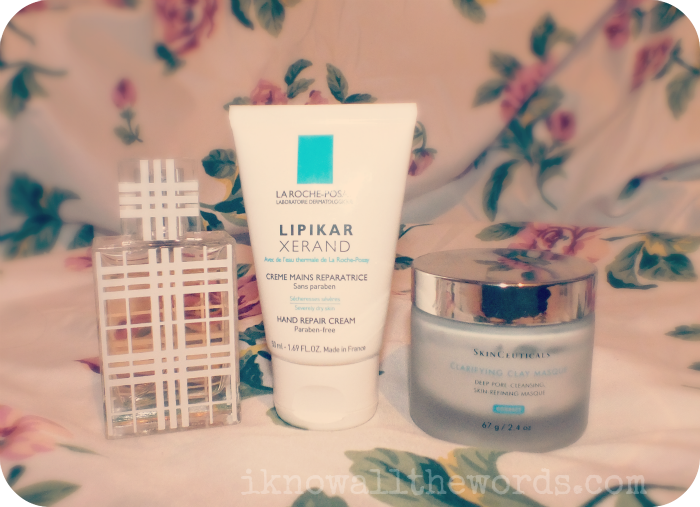 I go in spurts with hand cream; all too often I don't use it, but I have been making a habit of using it before bed and have found La Roche-Posay Lipikar Xerand Hand Repair Cream* to work wonderfully. It's a really moisturizing cream, but it does apply little bit on the greasy side so I don't often use it throughout the day. Bonus- it does double duty, and works nicely on feet too! It's no secret that I love masks, so I was surprised to find SkinCeuticals Clarifying Clay Masque* abandoned in the back of my bathroom cupboard last month. Clearly it was an accidental misplacement, as this is a really fantastic mask. Unlike other clay masks that can end up drying out my already dry skin, this mask is a major multi-takser as it not only heals and calms skin, but it also decongestants pores and lightly exfoliates skin. I've had this for a little while, so I am on a mission to use it regularly and finish it off. I hate to blab on about a product that isn't available anymore, but Philosophy Apricots and Cream Shampoo, Shower Gel & Bubble Bath just smells so great I had to give it a mention! I bought this quite some time ago, but it's only been the past month or so that I've started using it. This has a lightly sweetened scent of apricots and a hint of creamy vanilla- light and girly! I like that while you get great lather and scent while in the shower, the scent doesn't linger on skin, meaning you don't have to worry about it clashing with your fragrance of the day. I just learned that you can get pumps for these bottles, so I definitely have to get on that as these can be annoying to use in the shower once you get past the half way gone point. I have the terrible habit of not applying my body moisturizer right out of the shower, but now that so many products come in spray form, it's not as much of a hassle. 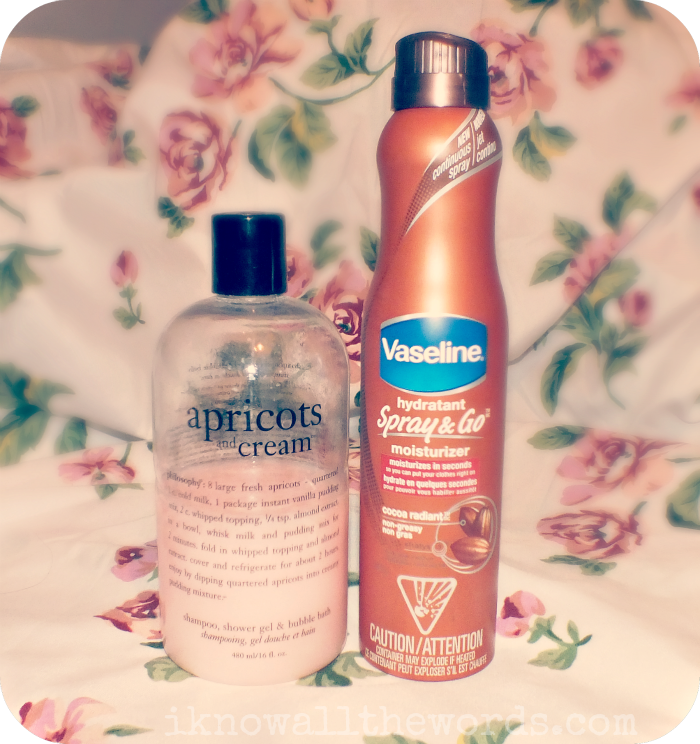 Vaseline Spray & Go Moisturizer in Cocoa Radiant (review) has been a daily staple for me. It's so easy to literally spray and go. Love it! Lately, I've been a bit obsessed with pink toned shadows. I know, not exactly what you think of as being all that wearable, but not bold pinks, but dusty, rosy shades incorporated into otherwise neutral looks. I was completely prepared to shell out $70 for the Bobbi Brown Lilac Rose Palette, but early reviews were not all that favourable, so I passed. 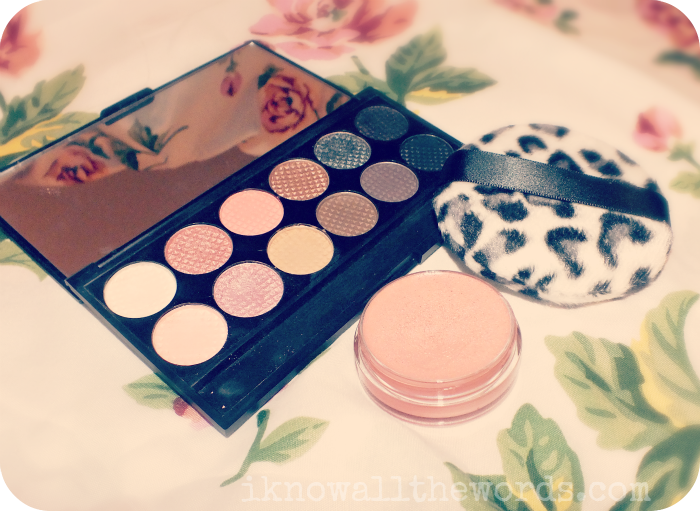 I've been getting my pink fix from the gorgeous shades in Sleek Oh So Special i-Divine Palette. These shadows- both the satin and mattes- apply so smoothly and easily and really are just great shadows overall. While these do fit the bill, I am still looking for the perfect pink shadow though. Something dusty... Any suggestions? As much as I love a bit fluffy powder brush to apply powder, my under eye concealer always creases. I've tried using a smaller fluffy brush for the under eye, but had little success. I decided to try a Powder Puff to press powder on- total life changer! You have no idea how thrilled I am to know my concealer will stay put. I don't use much powder on my face in cooler months, but now that it's getting warmer (or will be, it snowed here yesterday...) I've been using a bit of It Cosmetic Bye Bye Pores HD Finishing Powder (review) as it makes my skin feel so magically soft, and really does minimize the appearance of pores. Another item that is no longer available (at least I don't think...?) but never got much use- MAC Casual Colour Lip and Cheek Colour in Keep it Loose (review.) I've been trying to show love to products that have just been collecting dust, and this one happens to perfect for spring. Keep it Loose is a light peachy shade that when worn on cheeks gives a really natural, feminine flush. I didn't think that this wore too well on lips when I initially tried them, but on well prepped lips, and over a layer of good balm, it's not all that bad. My nails are pretty decent- for the most part. I take Biotin to help give them a bit of a nutrient boost, but with all the nail polish I wear and bashing about that they get from day to day, they do have a tendency to peel from time to time. OPI Nail Envy seems to get rave reviews from everyone who's tried it, so I decided I'd give it a go. I've made an effort to use it consistently- both on it's own and under polish- and can honestly say that it is in fact making a difference. I picked up a China Glaze treatment that is essentially the same thing as this, but you aren't supposed to wear polish over it, and it needs four weeks of regular use. Can you see the problem with that? I can't go that long without polish, so Nail Envy is defiantly a winner for me. Essie Lady Like has been on my wishlist for ages. I spotted it in store, snagged it, and it's been love ever since. I've been a long time Blistx Lip Medex fan, but when Carmex was introduced to Canada late last year I just had to give it a try. I was swayed by the fact that it's available flavoured, so Carmex Flavoured Lip Balm in Cherry ended up with me. I bought this a while ago and stashed it in a drawer, but I recently suffered through one hell of a cold, and needed something heavy duty for on my lips. This balm worked beautifully- not a flaking, cracked, cold induced chapped lip to be seen. I love Barry M Lip Glosses! A while ago I stocked up on a bunch of them, but I won't let myself get into them until I finish off my current tube- Barry M Lip Gloss #12 Strawberry Milkshake*. 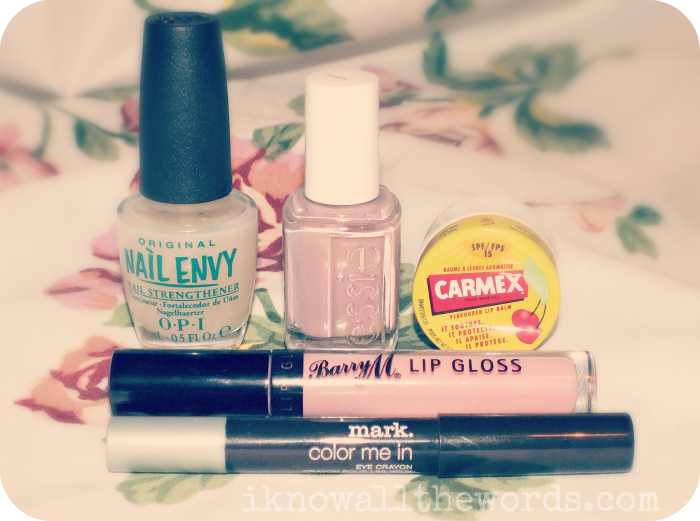 This is sheer, milky pink shade that wears well on it's own or paired with neutral/light lipsticks. I don't find that these last all that long on, but they wear so nicely I don't mind re-applying. Last, but not least, an very on trend shade that I've been using to perk up neutral looks- mark. Colur Me in Eye Crayon in Mint Candy*(review.) I've been using this along my lower lash line with shadows from my Urban Decay Naked Palette. It's adds a nice bit of colour and contrast with out being too flashy. Do you have any items that have been in heavy rotation? Do share!